We can all see the writing on the wall. Fossil fuels are dying as an energy source. A global movement to sustainable “green” energy is gaining momentum … and President Donald Trump’s trade war on solar panels isn’t going to stop it. Once worshiped as a deity, the sun is truly the once and future king of energy. Solar energy is abundant, free and available practically everywhere. What’s more, as oil prices rise, and they will rise again this year, the demand for alternatives rises alongside it. In fact, global demand for solar energy and solar panel installations is surging. In the U.S. alone, the U.S. Bureau of Labor Statistics projects that solar panel installers will see job growth of 105.3% from 2016 to 2026. That rising demand drives investment, lowers production costs and makes these green options cheaper for the general populace. While solar energy is essentially free, harnessing it isn’t. That’s where companies like First Solar Inc. (Nasdaq: FSLR) and Tesla Inc. (Nasdaq: TSLA) come in. They provide the solar panels and batteries necessary to convert, store and effectively utilize the sun’s energy. But there’s no need to follow the crowd when looking for opportunities in solar energy stocks. There are more than a few outliers and diamonds in the rough that could help your portfolio realize considerable gains this year. My leading pick for solar investment is one of First Solar’s biggest stateside competitors. SunPower specializes in solar power components, including panels, and offers installation services as well as utility-level power plant systems. With a focus on installing systems, SunPower stock has taken a beating from the Trump solar tariffs announcement. Most of the company’s components are manufactured overseas in China. Many investors believed that SunPower would escape the worst of the tariffs, and they bid the shares up at the end of 2017 as a result. With speculative gains now wiped out (and then some), SunPower stock can now begin trading at a more reasonable clip. The long-term outlook remains solid for SunPower, especially with solar installs surging in the U.S. and globally. Analysts expect revenue growth of 11.6% this year, which, if oil prices continue to rise, may be a conservative estimate. Finally, with SunPower stock trading near oversold levels following Trump’s announcement, now may be a good time to add a few shares to your portfolio. I first discovered this gem of a company after my colleague Ian Dyer wrote about it back in November. What makes SolarWindow so special? The company makes a clear liquid coating for windows that turns them into solar panels. The benefits are obvious. For one, the lack of large panels attached to your home or building makes SolarWindow’s products aesthetically pleasing. But the ability to simply spray “solar panels” on existing buildings creates enormous opportunities in large metropolitan areas where traditional panels would be a hinderance. SolarWindow stock is up more than 80% since Ian recommended the shares, and I believe there is considerable upside left untapped. The shares are fresh off a bounce from their 50-day moving average and are in the process of re-establishing support at their 20-day trendline. SolarWindow shares are also far from overbought territory, meaning that there is still room to run despite the recent rally. 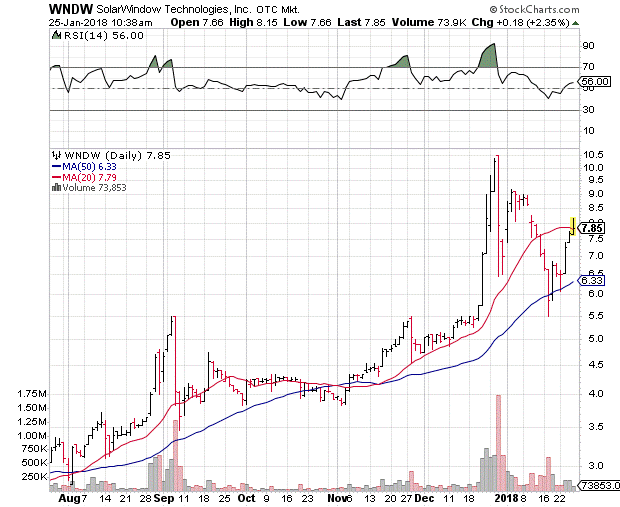 And with the new Trump tariffs impacting prices of traditional solar panels, WNDW stock is even more of a buy right now. My last pick for profiting from the solar revolution is not a solar stock at all. Orocobre explores for and develops lithium and potash deposits in Argentina. The problem with solar power is that the sun doesn’t always shine and generated energy isn’t always completely used up. To make solar systems more efficient, you need a way to store that energy. Right now, the leading storage option is lithium batteries. Yes, I’m cheating a bit here for a solar investment play, but lithium and solar energy are basically hand-in-hand until someone develops another means of energy storage. I mentioned Orocobre as a possible lithium investment back in July, and the shares have been impressive. 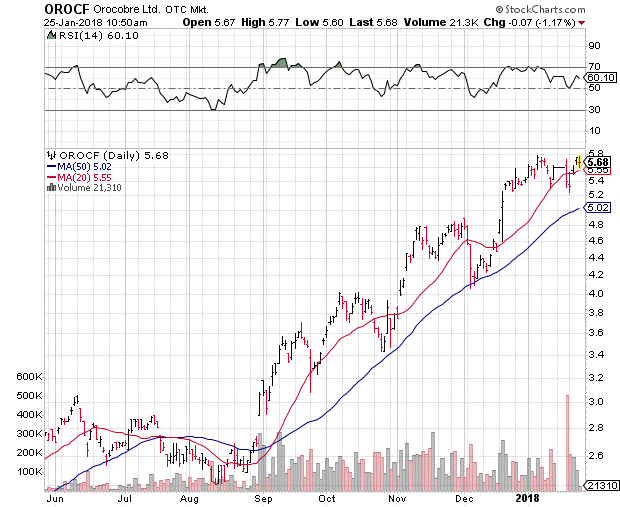 Orocobre is up more than 100% since I last looked at the stock, with solid support at its 20- and 50-day moving averages. But these gains are just the tip of the iceberg. Earlier this month, Toyota subsidiary Toyota Tsusho bought a 15% stake in Orocobre for 282 million Australian dollars ($228 million). The deal led to speculation of a complete takeover of Orocobre as Toyota moves to secure a supply of lithium for its electric vehicle batteries. The Toyota deal valued Orocobre at $7.50 per share. At that valuation, there is considerable upside for the stock, making it a solid addition to your portfolio. Editor’s Note: The savviest investors are cashing in on “freedom checks.” You can get started too as soon as April 1, thanks to a program that authorizes agencies around the country to dole out $34.6 billion over the next year. Yes, that’s right — $34.6 billion. Any American taxpayer can stake a claim on the cash, but to start getting your freedom checks as soon as possible, you need to be signed up by April 1. Don’t wait ‘til the last minute! To find out how you can sign up today, click here now.